*Click on each gallery to see more! In November of 2008 we held our first Annual Fundraiser at Cannon's Blackthorn in Rockville Centre. This event is our largest fundraiser of the year. Each year new individuals and organizations are chosen as recipients. Nearly a decade later, this fundraiser is still held on the second Saturday of November at Cannon's and has grown into a wonderful community event. Click here to see some of the highlights and please join us NOVEMBER 11th 2017 5pm-8pm with after party to follow. In 2016, The Tommy Brull Foundation was honored to be chosen as the Local Charity by the Rockville Centre St. Patrick's Parade. This amazing organization works all year round to organize the 2rd largest parade of its kind in the tri-state area. This organization has taught us so much about fundraising and community as they celebrate their Irish Heritage. Their efforts awarded us $25,000 and an experience that will never be forgotten. In August of 2016 The Tommy Brull Foundation collaborated with The New York Wrestling Connection to bring this amazing exhibition to Camp ANCHOR in Lido Beach NY. The exhibition included a full size ring, a referee, and 15 professional wrestlers for an interactive show for all the children and adults at Camp ANCHOR. Click to picture to see hundreds of campers enjoy this great day. In January of 2017 The Tommy Brull Foundation sponsored and funded an adaptive ski trip for the Special Education Core students from South Side High School in Rockville Centre. A group of 30 students enjoyed a full day of skiing at Windham Mountain Resort guided by wonderful staff of the Adaptive Sports Foundation. In October of 2015, The Town of Hempstead honored our fundraising efforts with the dedication of the gymnasium at the Malone-Mulhall Recreation Center. We have raised over $100,000 for this program since 2008. Tommy, members of our family, and friends grew up working at this one of a kind recreational camp for people with special needs in Lido Beach. In 2015 a friend of the Foundation presented the concept of honoring an individual who continually works to overcome the challenges that life brings. The Courage and Resilience Award is presented to a person who we all can learn from. These recipients alway move forward no matter what challenges lie ahead. Please contact us if you know someone who embodies these qualities. Each year the Tommy Brull Foundation donates funds to this incredible inclusive baseball program. 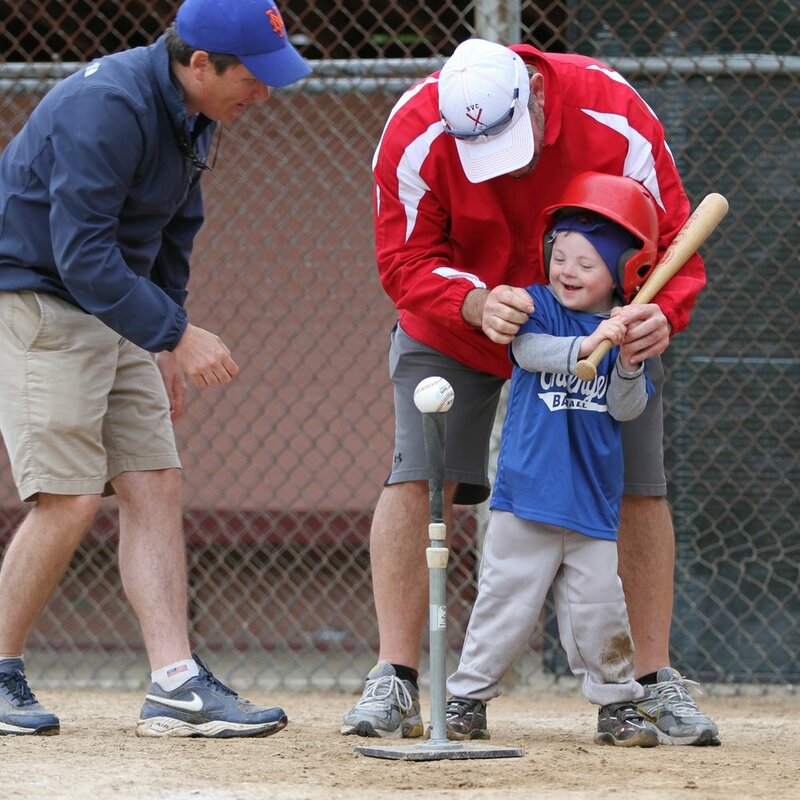 Typical children are paired with special needs children in a unique buddy program to teach the American tradition of baseball. Dylan, Petty & Young Fest Fundraiser for Mr B's Special Needs Playground. Each year the Tommy Brull Foundation donates funds to this incredible production that will make you smile and cry at the same time. This inclusive play teams typical students with actors and actresses with special needs. Ellen White and her team do an amazing job of building confidence and friendship for all students involved. Tommy loved surfing and loved Camp Anchor. In 2014, we founded the Tommy Brull Adaptive Surf Camp. The program runs five days a week for six weeks at Camp Anchor. Over 400 people have been given the opportunity to experience the joy of surfing. The sport of Surfing has helped build pride, self worth, and confidence for both the surfer and their family. The caring staff, the proud smiles of the surfers, and the tears of joy from their parents are what make this program so special.